The Website step is part of the BUILD stage in our proven process along with 'Foundation'. While it is easy to think of your website as a desktop entity, in a time where responsive sites are the default, we take a mobile first approach to building websites on HubSpot. The new gold standard for website design recognises the need to build websites on continual improvement cycles informed by visitor behaviour rather than guesses. Equinet specialise in designing websites on the HubSpot CMS. Actually, that's the only place we design websites. And we only design websites for Inbound. Happy with your site and want to implement inbound with your existing setup? We add HubSpot script to your site then build the blog and landing pages on HubSpot. The way we traditionally approach building and maintaining a website is fraught with systemic risk and can cost your business time, money and opportunity. Growth Driven design is a better way, a way that challenges the assumptions of the traditional web design process, a new way to approach websites with significant upsides. 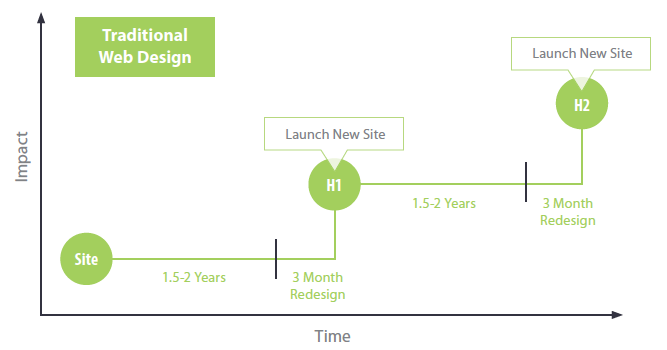 If you've been involved in a site redesign before, you may not have fully enjoyed the process. Did it take longer to launch than anticipated? was it over budget? Maybe there was a significant up-front cost? And, after launch, it's not uncommon for a new website to remain untouched, without updates for two or three years. 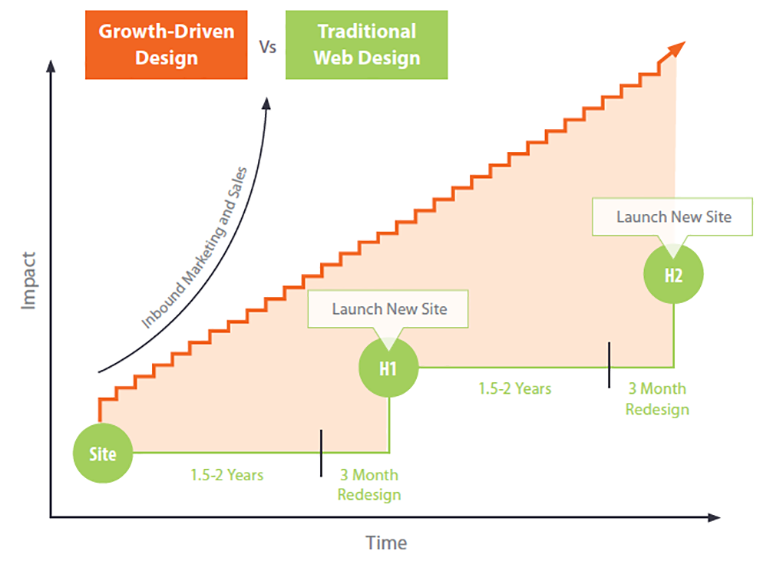 Growth-Driven Design is a new approach and way of thinking about designing and developing your website. An approach where we shorten the time to launch, focus on real impact, continuous learning and improvement, constantly researching, testing and learning about visitors to inform on-going enhancements. Through this cycle of continuous improvement, what we learn about visitors helps inform and improve marketing and sales strategies and tactics (and vice versa). Goals: What are the performance goals we are trying to achieve with our website? How have we performed historically, where would we like to improve and how will this impact overall marketing goals? Personas: Next, unless we have already done this during your Inbound Strategy Blueprint, we will develop detailed persona profiles for the different types of groups visiting the site. Qualitative Research: We dig into the data and perform a quantitative audit of how your existing site is performing, reviewing what is, and is not, performing well, where users are dropping off, etc. Quantitative Research: After identifying areas of opportunity through your audit, we reach out to your existing users to learn more about them, gain a better understanding of who they are and find ways to improve. 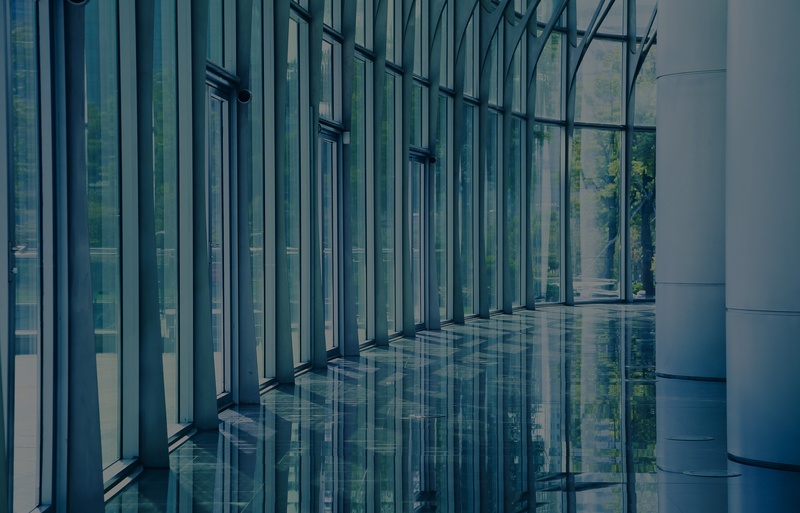 Fundamental Assumptions: Using what we’ve learned in previous steps, we form fundamental assumptions about users including value propositions, locations and devices, and what information your users are looking for. Global and Page Strategy: We develop a global strategy for the site and page-by-page strategy for each major page on the site. Both incorporate previous steps and lay out details of how to best engage and influence the user to attain your goals. The next step is developing your Wishlist. Taking what we’ve learned in your strategy planning, we brainstorm every idea you’d like to include on the site. The key is to come into a brainstorming session with an 'open view'. A view free from the constraints of your existing site. What should be on the list if money, time and development skills were not an issue? We will compile an extensive list of ideas, not all to do right away. But it’s important to flesh out as many as possible. Your wishlist determines the initial action items we must put in place on the new site. But it is an agile list, added to (and subtracting from) as we re-prioritise actions items over time. We review the list to identify the 20 per cent that will produce 80 per cent of the impact and value for website users. Then we pull them to the side and do more filtering asking, is this action item a 'must have' or a 'nice to have'? – If it's the latter, return it back to the main list. With remaining items, are they necessary for the Launch Pad site, or could we build them in month three or four? The goal is to narrow your focus to the core 'must have' action items that will provide the most impact. It’s essential to narrow down to these core action items to ensure a quick launch. Once we have narrowed our list of action items for the Launch Pad website down to the core 20% most impactful, “must have” items, we will create a “hypothesis statement” for each one of the action items. The hypothesis statement allows us to gain clarity on how each action item relates back to the goals we’re trying to achieve, the persona we’re focusing on and the expected impact this change or update will have. With a traditional web design process, we think of the launch as the finish. With Growth-Driven Design it is the opposite. The Launch Pad website is the point from which all activities and improvements start. 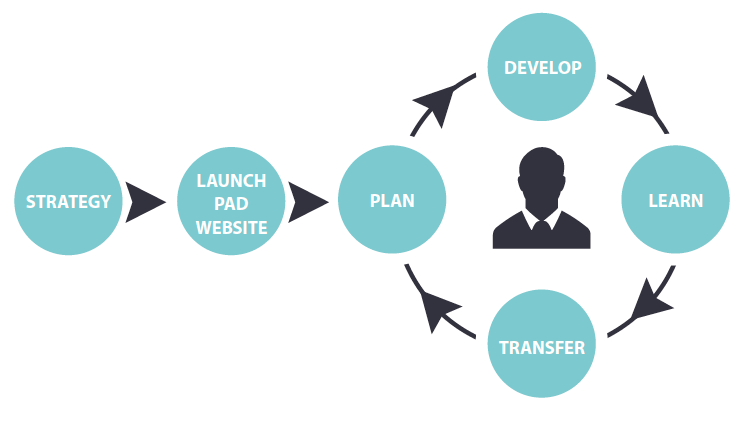 A Launch Pad website should launch quickly. We need to avoid spending too much time on analysis, features or content before launch - it may not be perfect, but no website is. But it is likely to be an improvement on your current site. It gives us a starting point from which we can improve. But now we will make improvements based on real data and actual behaviour. Not the guesses we acted on before launching a traditional site. The size and complexity of the Launch Pad website will vary depending on what you have on your wishlist. But, it’s important that we’re able to boil it down to the essential 20% that will make an impact. And to launch fast so we can get to learning about your users and improving the site. Once we have launched, we start on-going cycles to experiment, learn and improve. And we still have a long wishlist of impactful items that we’d like to install on the site. This cycle starts with and revolves around your personas. At each stage, we ask how this relates and provides value to them. If it becomes unclear how an action item provides value or relates to your persona, we take a step back and re-evaluate what we’re working on. Plan: The first step is planning the most impactful items at the current moment to install into the current cycle. The number we choose will depend on how long the cycle is. We’re better off picking fewer items and focusing on doing our best work with them. If we complete them early, we can go back to the wishlist and pick more. Develop: We now have the most impactful action items to start implementing on the site. Each action item is an experiment and we will setup validation tracking on the metrics outlined in the action item. We may want to develop a marketing campaign (social, PPC, blogging, etc.) to drive traffic to that section of the site so we can start collecting more data. Transfer: The last step in the cycle is to review what we’ve learned from each completed action item. We brainstorm how this may be useful for others and transfer impactful information to other parts of your business. 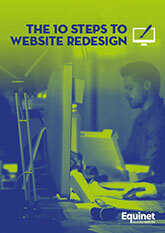 Download this eBook and get a deeper look under the hood of this new approach to website redesign. 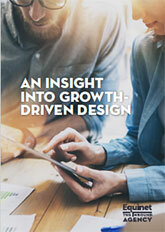 Explore the strategy and discover the steps needed to implement a growth-driven-design programme as well as understanding the level of commitment required in an investment like this. Defining real problems with a site is not always straightforward - here are clear signs that its time for a website redesign. If your site’s not converting visitors to leads, you are probably haemorrhaging opportunities. Your website is often the first impression you’ll make, and if it sits like a pretty face with no mechanism for interactivity other than offering up your phone number, that first date's going to be short. People are visiting your site from multiple devices. A significant proportion of your traffic is already from mobile - and those mobile visitors do care. If your website's not working on the leading browsers and devices, you are quite literally ignoring potential customers. The only reason a site should look retro is if it's selling the past. Anything else and you need to look current. A visitor should get a sense of your company through your website. A modern website will focus on user experience and the interface as well as the content. If your site offers a look or performance that is outdated, then so does your business. The bottom line - if your website is not helping your business, it’s not working. If it's not attracting the right people, at the right time, and converting them to leads and sales, and it's not current and easy to use, then maybe it's time for a website redesign. A radical redesign can transform your site into a hub of customer interaction and thing of beauty... or it could fail spectacularly! Our 10-Step Redesign Checklist will show you how to avoid the pitfalls and make sure you consider such an important undertaking from all the angels. If you are not going to be hosting your website on HubSpot, or if you have website pages that are not going to be hosted on the CMS, we'll need to install the HubSpot tracking code on those non-HubSpot pages to capture the analytics. The tracking code will help us monitor how well your website is generating traffic and converting leads. It will provide insight into things that could be done to improve site traffic and provide lead intelligence that could help you convert more website leads to sales. Your tracking code will be installed automatically on your HubSpot hosted pages like the landing pages and the blog, both which are required to deliver inbound marketing for you.